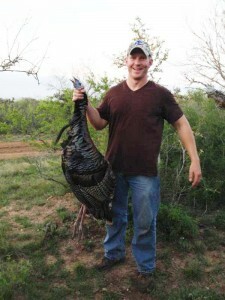 Tatonka Creek Ranch is proud to offer some of the best hunting country for Big Rio Grande Turkey. Our turkey population is WILD! They are very elusive and unpredictable game birds, so we cannot guarantee these hunts, however our success rate is rather high. Plus you only pay the full price if you wound or harvest a bird. Try getting this offer anywhere else!! 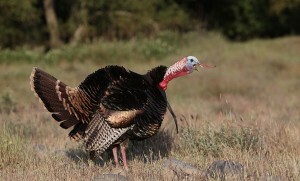 Most of our turkey hunts are blind/feeder hunts or hunters are welcome to roam the ranch using calls to bring in the gobblers. We do not over hunt our turkey so hunts are limited. We highly recommend weekday hunts when overall hunting traffic is lighter. 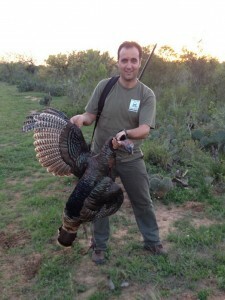 2019 Spring Turkey Package – 2 Days/2 Nights lodging /1 Turkey – $350 (additional bird $200). Minimum of 2 hunters required. Exotic game can be added during the hunt. Season runs March 16-April 28, 2019.